Timing of Swearing-in-Ceremony shows l Annual Forecast 2018 l Holika Dahan on March 12 l Jupiter enters the zodiac of Libra rashi on 12th September, 2017 l Akshay Tritya highly auspicious day l Planets movment making notable impact on Share Market l Saturn’s Acceleration to Sagittarius in 2017 l How to please Shani by your Karma? l We proved right on Modi & BJP win in May 2014 l Is your name lucky for you? 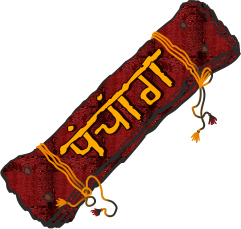 Panchang is a spiritual and scientific and ancient Hindu (Indian) calendar which is derived from Vedic astrology. The Panchang measures time in lunar months. In selection of “ Muhuruta” and for all religious and social functions , lunar month is followed . Every month reveals secret path of stars and constellations and every day of each month is identified with planets and gods. Every lunar month is divided into two equal halves of 15 days each, Dark half (Krishan Paksha ) and bright half ( Shukul Paksha) It is derived from two words - Panch (Five) and Ang (aspect). Panchang prescribes that each day is divided into five aspects - var or Day (the solar day), Tithi (lunar day), Nakshatra (constellation), Yoga (conjunction) and Karan (one half of lunar day).Tithi or 'lunar day' is a very important conception in Hindu astronomy. Every month reveals secret path of stars and constellations and each date is called a Tithi which is caused by the angle formed by the changing positions of the moon and sun in transit. The day when Sun & moon are together in a sign at the same degree is called the 30th date which is also known as the ‘Amavasya’ or new moon and as moon advances beyond the sun , each difference of 12º away from the sun ,causes the formation of new Tithi. When the moon reaches 180º beyond the sun and is diametrically opposite to the latter, the date formed is called ‘Poornima’ or the full moon. In each of the two fortnights, of the month, dark half and bright half, the names of all the dates Tithis’ except the ending ‘Tithis are identical . Ending Tithis are Amavasya and Poornima for ‘ Krishan Paksha’ and ‘Shukla Paksha’ respectively. The knowledge of tithi (date) brings prosperity, vara prolongs life. Nakshatras removes misdeeds, yoga gives immunity from diseases and karana & hora lead to success. Vedas, prescribe that a person can become free from all his misdeeds if he truly follows what is written in the Panchang.The zodiac is marked by 27 constellations or Nakshatras often termed lunar mansions. The position of a Nakshatra is dependent upon the actual time taken by the Moon to traverse 13° 20.' of ecliptic arc, of course, always beginning from the first point of the constellational zodiac. Yoga is another component of the panchang after Tithi, var & nakshatra. It is the period during which the joint motion in longitude of the Sun and the Moon amounts to 13° 20'. There are twenty-seven Yogas.And finally we have Karana, or half a lunar day meaning thereby the time taken to complete the distance which should be the multiple of 6 between the Sun and Moon. To find the auspicious time to start anything new it considers the weekday of week (Vara), Tithi, Nakshatra (Star), Yoga of the day, Karana of the day, and the ending moments of all these to determine whether the day is Amrita, Siddha or Marana. Several benefic and malefic yogas are formed by the permutation and combination of different parts of Panchaga. While the good yogas enhance the strength of a ‘ Muhuruta’ , the bad yogas prove disastrous for the success of any activity. In the Panchang we have different columns showing its different parameters. First is the Date is date of the month and day is Vaar of the week like Sunday or Monday. Next is Tithi. Names of different tithis are shown below the table. In Indian Astrology, the calculation of the Tithis starts from Pratipada (The first day in each half of the lunar month) of the Shukla-Paksha Time specified in the next column is ending time of tithi. Next is Number & name of Nakshatra. The number and the time is specified in the column of time. Next is yoga number & name. The yoga period is also up to a certain time which is written in the time column. In the last column we have Names of Yoga. Note : 1. S-Suklapaksha, K-Krishnapaksha. 2. Timings given are ending moments (in IST) reckoned from Sunrise to Sunrise. © 2011 Astrodaily.com. All Rights Reserved.